09 Jan January Sweat + Tears Bootcamp Very Special Deal : We will make your New Year resolutions happen. Are you feeling bloated and toxic after Christmas? Did you make health and fitness resolutions? Are you embarrassed getting into those new swimmers you got for summer? Are you not in the best shape you could be? 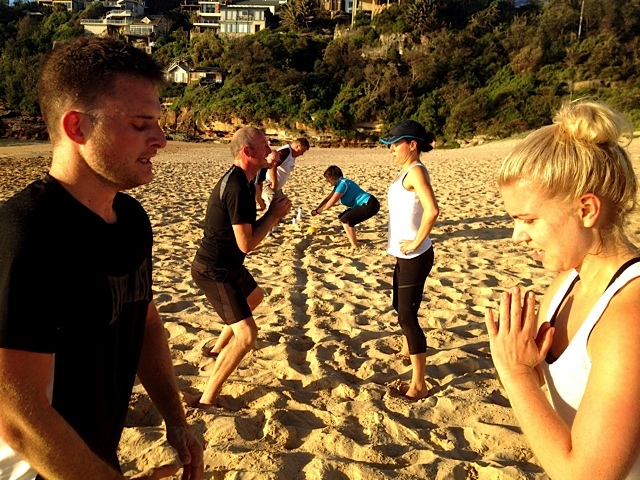 Come and join us on the sand at Freshwater for our Tuesday Thursday Sweat + Tears Bootcamp. It’s fun, safe, in beautiful surroundings, a great way to start the day but most importantly… it works!! Get fit, feel better about yourself, have a great time. If you sign up for a 4 week pass ($160) or a ten session pass ($225) before close of business this Friday (11th January 2013) , you get to have 1 session a week at “The Garage” for FREE for the next 4 weeks (a one off casual session at the Garage is valued at $40)… That’s $120 worth of extra training for FREE… or if you want to look at it another way you get 3 sessions a week for the price of two…. How good is that? And you get to choose any class you want from Boxing, Strength Training or Conditioning, even Olympic weightlifting if you want to give a go to something new!!! NOT JUST THAT THOUGH: if you sign up today you get to attend tomorrow morning’s session for FREE as well. Meet every Tuesday and Thursday. 5:45am Moore Road Car Park, Freshwater (Below Pilu Restaurant). Book in NOW via the LOG IN tab in the top right hand corner. Go to >make a Payment>Intro/Flexi Packages>Bootcamp and select your package. Then go to the class schedule and book in for the Bootcamp classes of your choice.